A travel-sized version of the Gold-D6. Cort has released the Gold Mini acoustic guitar, a 3/4-sized version of its Gold-D6 dreadnought model. With a shorter scale length of 22.8 inches, this compact design was created with travellers in mind. Another key difference between the Gold Mini and its larger cousin is the choice of top woods. 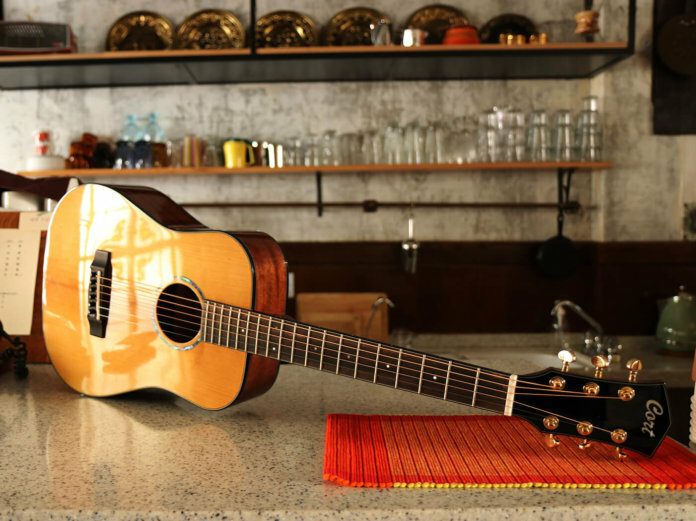 The new guitar features a torrefied solid Adirondack spruce top – instead of Sitka spruce – that caters for broad dynamics as well as increased articulation and smoothness, according to Cort. The top has also undergone Cort’s ATV (Aged to Vintage) treatment and features a modernised X-bracing. The former aims to provide a big, vintage-like acoustic tone, while the latter has been “aggressively scalloped to free up added top vibration”, the brand says. Otherwise, many of the Gold-D6’s features have found their way to the Gold Mini. At the neck, you’ll find a traditional dovetail joint that’s reinforced with an added bolt, which helps enhance tone transference and resonance, as Cort claims. Other similar features include a walnut-reinforced neck – for added stability – as well as a Macassar ebony fretboard with a rounded edge. On the aesthetics front, the Gold Mini has an abalone rosette, black binding with triple-ply purfling, and die-cast gold tuners with an 18:1 tuning ratio. Retails at $799.99. More info at cortguitars.com.